You can play both cash game poker and tournament poker online. When it comes to tournaments, they can roughly be divided into two categories: scheduled tournaments and sit and go tournaments. Scheduled tournaments are planned in advance and have a predetermined starting time. Sit and go tournaments start when enough players have entered the tournament. Sit and go tournaments are often single-table tournaments, which means that it doesn’t take many players for them to fill up an start. However, multi-table sit and go tournaments are also available, especially in high-traffic poker rooms and poker networks online. Unlike offline poker rooms, online poker rooms can offer super low-stakes poker since they don’t have to pay salary to any poker dealer. This is great for the novice that wants to learn how to play poker, but you should be aware that you will need to adjust your strategy as you move up and start playing at poker tables where the stakes are higher. This is true for tournament poker as well; a strategy that works great in low-stakes poker tournaments might be completely wrong for a tournament that is more expensive to enter. Online poker appeared on the internet as early as the 1990s, when people started playing IRC poker for free. 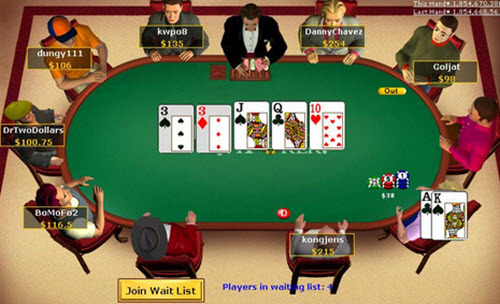 In 1998, the trailblazing poker site Planet Poker was launched, allowing poker players to wager real money. During the first half of the 2000’s, online poker went through rapid expansion due to a series of factors. The invention of the hole camera made poker games more interesting for TV viewers and TV shows helped popularize poker in general and the poker variant No Limit Texas Hold’em in particular. A lot of people who developed an interest in poker after watching these shows turned to poker rooms online. In 2005, Chris Moneymaker won entrance to World Series of Poker Main Event in Las Vegas by playing a poker tournament online, and when he went on to win the Main Event, this had a huge positive impact on the ties between online and offline poker. Of course, online poker isn’t just a means to gain entrance to offline poker tournaments. Quite the contrary, many famous and not so famous poker players are making a bulk of their money by playing cash games and/ or tournaments online. Online poker has lower associated costs for the player than offline poker, which means that even a fairly low stakes player can make a nice yearly profit. Unless you happened to live near a local poker room, making a decent profit from offline poker usually require that you win enough to pay for travel, hotel accommodation, and so on. Since the legal situation for online poker has been unclear in the United States, many poker rooms have banned U.S. players in an effort to avoid being tangled up with U.S. authorities. Examples of poker rooms online that still allow U.S. players are Bodog, Winning and Chico. The two largest online poker rooms – PokerStars and 888 Poker – both block U.S. players. The same is true for iPoker, the largest poker network online.